​register or update their information online every January. By tradition, all Al-Anon meetings are open to any member or prospective member of the fellowship. Unless otherwise indicated, all meetings are presumed "Closed" to non-member visitors, such as professionals, researchers, or students. 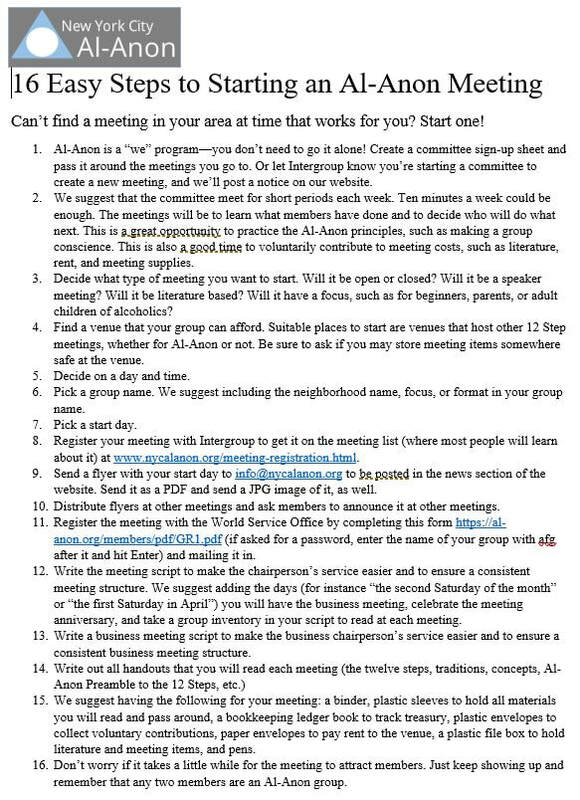 "Open" meetings welcome non-member visitors. Al-Anon is a mutual support group. Everyone at the meeting has experienced problems with someone else's drinking. Everyone shares as an equal. You are free to talk and ask questions. Or, if you’d rather listen, simply say so. Everything you say stays within the meeting. Members typically go by their first name and last initial. Meetings pay their expenses by soliciting contributions from members. No one is under any obligation to contribute. Meetings vary - try a few. Each meeting has the autonomy to run as its members choose, within broad guidelines. an excellent place to start. For ELECTRONIC and PHONE meetings click here. It's common to have questions before attending your first meeting. Feel free to contact the Intergroup office to speak with a volunteer about Al-Anon.